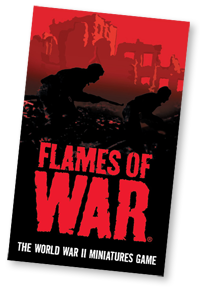 As many of you know, Battlefront is about to release Flames of War version 3. Check out this video for some news about the new books, and the sweet freebie that our Kiwi friends are giving to folks who own a copy of V2. Initially I was very worried when I heard that V3 was coming out. I felt this way because I am very fond of the version 2 rules, and can think of little that I would change. Now that I have heard some of the rumors about what is likely to change, and how, I am very excited about the new edition! It’s going to be quite a hustle to get up on these prior to Adepticon, but the rest of the group is chomping at the bit as well, so I imagine that the spring will be replete with the sound of tank engines, machine-gun fire, and exploding artillery shells! Spartacus moment: I am Fan-Boy…..